In thanksgiving to God on the fifth anniversary of my Ordination to the Priesthood, I celebrated a Low Mass in the Dominican rite. 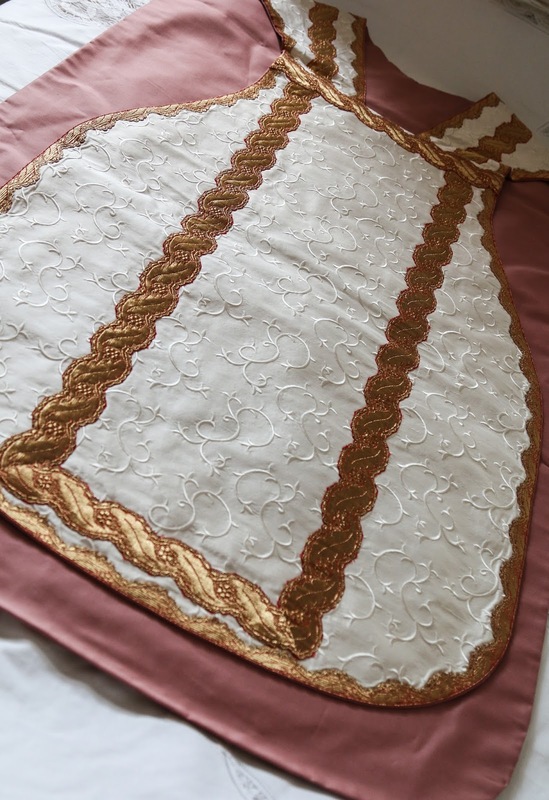 The vestment worn for the first time on this occasion, at a Saturday Mass of Our Lady, was a gift commissioned in memory of my grandparents, and it was made by a talented young seamstress based in England, Geneviève Gomi who has had years of experience in vestment restoration and embroidery. 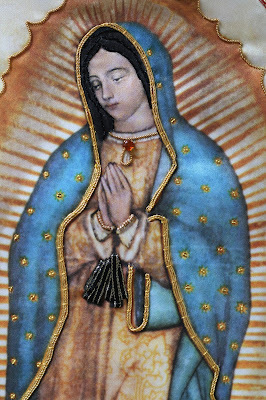 Six years ago on the feast of Our Lady of Guadalupe, to whom I have a special devotion, I had been involved in a serious bus accident in Oxfordshire. As I emerged unscathed from the wreckage of the bus, I attributed this miracle to the protection of Our Lady of Guadalupe. A motet by Sir James MacMillan CBE was subsequently written for my Ordination in 2011, and it was offered to Our Lady in thanksgiving (see video below, which has scenes from the Ordination). 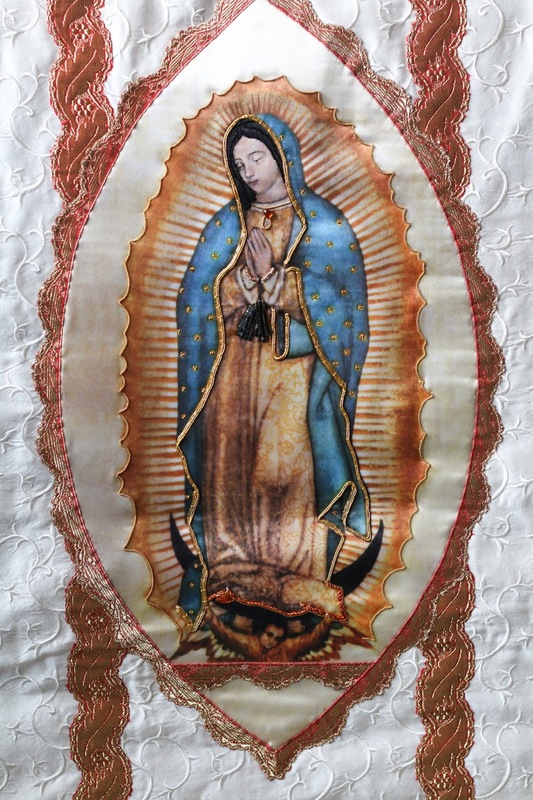 This new vestment set has been, likewise, offered in thanksgiving to Our Lady of Guadalupe for her protection. I have often felt dissatisfied with embroidered images of Our Lady of Guadalupe – they just do not look like the image on the sacred tilma in Mexico City. So, after consultation with Miss Gomi, it seemed that a printed photograph of the Virgin would be the best way to render the face of Our Lady of Guadalupe as faithfully as possible. Moreover, as the miraculous image is itself some kind of celestial photograph, this seemed most apt. The image is thus printed on fine Habotai silk and certain details have been emphasised with gold and coloured silk embroidery. The chasuble itself is made from a bespoke embroidered dupion silk fabric from Marseilles, but it is relatively simple so that it does not distract from the image of Our Lady. Moreover, as one finds with many old Marian chasubles, it is lined in fabric of a dusky rose colour. In a homily given to priests at the Chrism Mass in Rome in 2007, Pope Benedict XVI said that "liturgical vestments must make it clearly visible to those present that we are there 'in the person of an Other'", and then, citing Pope St Gregory the Great, he said the Priest has to wear "clothes of love... which alone can make us beautiful". Accordingly, this chasuble was made with love by a devoted Catholic seamstress, and they were worn with love for Our Lord and his Blessed Mother. 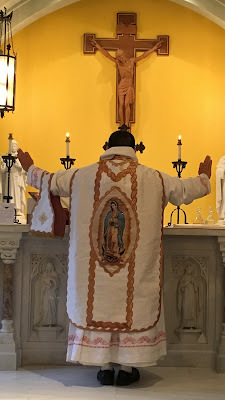 In our attention to beautiful Liturgy that is worthy of God we should not neglect the vestments that are worn at the Altar, and whenever possible, we should encourage new talent and commission from them works of sacred art that can stir us to greater devotion; let us offer to God the very best we can muster. To this end, do visit the site of Geneviève Gomi, and please offer her your prayers and encouragement; she can be contacted at: g.gomi@hotmail.com.